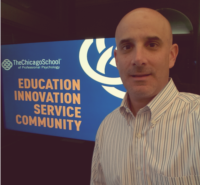 Dr. Rosen is a core faculty member with the Industrial-Organizational/Business Psychology Department at The Chicago School of Professional Psychology (Los Angeles Campus). He teaches courses in all specialties within the Department and his research interests include multiple aspects of Leadership, Organizational Culture, Change Management, Performance Management and Employee Engagement. Additionally, Dr. Rosen brings his wealth of experience working within and consulting with Fortune 500 Organizations as well as Government entities to the classroom and his supervision of doctoral research.